When the working forces in a die are not distributed evenly across the press slide, the slide will tip and move laterally in the direction of the greatest force. If this movement occurs with the punches engaged with other die components, excessive wear or damage may occur. Die wear increases die-maintenance costs and compromises dimensional consistency of the stampings being produced. Stampers must assess and address slide tipping—sometimes called tipping moments—during the process-layout and die-design phases of a project. Unfortunately, many tooling engineers and die-process engineers do not fully understand the impact of off-center loading on part quality and die life. As a result, many dies are designed, manufactured and installed in presses without any consideration given to centering the load. Progressive and transfer dies produce many types of stamped parts. Consolidation of multiple parts into a single stamping and down-gauging material thickness to reduce component weight increases part complexity. This complexity often requires dies with a greater number of process steps, which increases die length. As a result, distributing die loads evenly across the press slide becomes difficult. The strip layout in the accompanying illustration represents a process for an eight-station progressive die. To calculate the tipping moments, multiply the cutting and forming forces by the distance from the center of the press where the forces act. Using the center of the press as the origin, distances to the left would have negative values while the distances to right would be positive. In a perfect world, the sum of all of the moments would equal zero, indicating balanced forces across the press slide. Table 1 quantifies the cutting and forming forces for each die station, and the distance from the center of the press where those forces act. The last column in the table shows the resultant moments at each die station. 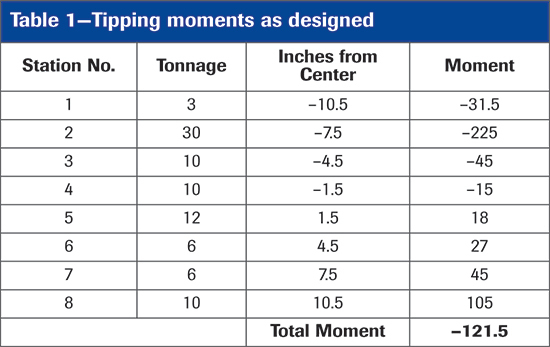 Here, the sum of all of the moments equals –121.5 in.-tons, indicating an unbalanced load across the slide. Stampers can select from several possible solutions to correct slide tipping. 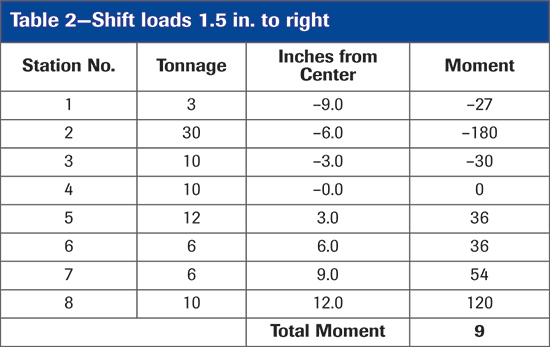 These remedies often are implemented after die tryout when the unbalanced loads become apparent from tonnage-monitor readings. Two common remedies: shifting the die in the press, or introducing a dummy load somewhere in the die. If the die cannot be shifted in the press due to a lack of room on the press bed, adding a dummy load often is the only recourse. To introduce a dummy load, the stamper typically adds a pressure system or coining station to balance the loads. A better solution would be to address the problem during die design. Here, process and die-design engineers must recognize that these loads exist during process layout, calculate their magnitudes and make appropriate changes in the final die design to balance the loads. For example, shifting the strip layout in the above illustration to the right 1.5 in. would position the pilot hole at station four on the centerline of the press. This would substantially reduce the resulting moments (Table 2). Shifting the die strip would require that the die slightly increase in length. If this is not possible due to limited press-bed space, strategically applying shear to select cutting punches would help balance the loads. For example, adding metal thickness shear to the cutting punch in station two reduces cutting force by approximately 50 percent (Table 3), balancing the loads across the press slide. Another benefit of the punch shear: reduced impact load, shock and vibration. It’s not necessary to perfectly balance all of the forces across the slide. The press structure and die-guiding systems can handle some off-center loading. In fact, it may be impossible to balance the loads for many processes, especially in progressive dies. Even under ideal conditions where the sum of all of the moments equals zero, some slide tipping will occur because all of the moment forces are not generated at the same time. This occurs because the forces generated by forming processes may occur ½ in. or more above the bottom of the press stroke, while punching and blanking forces occur at the very bottom of the stroke.